​During pregnancy, your body goes through a lot of changes that most of us overlook. The changes that occur to your muscles and joints can make you more vulnerable to low back pain during your pregnancy and once you have given birth. However, by taking some simple steps you can minimise these effects. ​Pregnancy can cause many changes to your posture. As your baby grows and the uterus expands, your pelvis will tip forward to make space for the growing baby. This can increase the arch in your lower back and put a lot of pressure on the small joints in your lower back. The pelvis tilting forward can also cause changes in the rest of your spine too, with the thorax becoming more curved and the shoulders more rounded leading to a hyper lordotic posture. As a result, some muscle groups may become stretched and weak, whilst other muscles may have to work harder and become shortened and tight leading to muscle imbalance. During pregnancy you get a shift in your centre of gravity, and after giving birth you get another shift in gravity which the body has to get used to. ​When you are pregnant you release certain hormones such as Relaxin. These hormones stimulate lengthening and laxity of the ligaments and connective tissue that help support and surround your joints allowing the pelvic outlet to expand during labour and delivery. However, this joint laxity can also leave joints more vulnerable to injury. The pelvic floor refers to a group of muscles that actively support your pelvic contents (bladder, back passage, womb). It’s also involved in the control of passing urine and bowel motions and increase pleasure during sexual activity. During pregnancy the weight of the baby and amniotic fluid can put a lot pressure on the pelvic floor. Also, as you give birth the pelvic floor muscles need to relax and stretch to allow baby out. Your abdominal muscles play an important role in stabilising your back and pelvis. 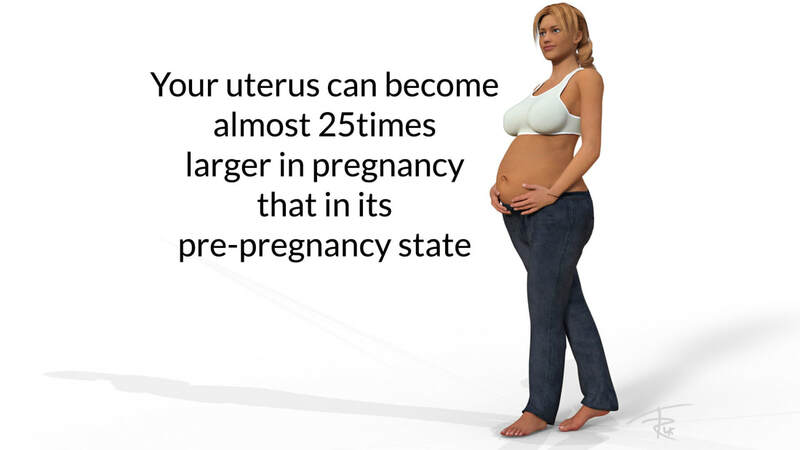 As your uterus grows in pregnancy the abdominal muscles can stretch and become weaker. Some people during and after pregnancy can develop a gap in their tummy muscles (also known as a diastasis). The vertical line of tissue in the center of the abdominals can weaken or part (Distastes) during pregnancy. - Ensure you are well supported when you are sitting, especially if you are feeding or holding baby. Placing baby on a couple of pillows when breast feeding. This will bring baby up towards you and stop you slouching. - Avoid spending a long period of time with an arched back or fully flexed back. Lordotic postures or very arched back postures put a lot of pressure through the small joints (facet joints) and ligaments of your lower back. Sustained flexed postures can impair the reflexes that enable the back muscles to protect the spine when bending. Try and avoid heavy lifting if you can, lift slowly with the spine balanced and slightly bent, muscles relaxed and the weight close to and in front of the body. These factors help reduce compressive forces on the spine. It is safe to start pelvic floor exercises once you have passed urine following the birth. They can help reduce swelling, increase blood flow and improve healing following birth. The pelvic floor is made up of 3 layers. The first 2 layers close the sphincters and the 3rd layer lifts the pelvic floor. When contracting the pelvic floor imagine that you are drawing your coccyx towards your pubis first and then draw the pelvic floor up into the pelvis. For more information on ways to exercise the pelvic floor and deep abdominals effectively why not book in for an initial assessment with Minal. You can then be certain that you are doing them correctly and that they are correct and appropriate for your own individual presentation. Back pain, both before and after pregnancy, is a specialist area of physiotherapy so please ensure that you are getting specific expertise rather than generic 'one fits all' advice. If you have a query as to whether a session at team Rehab uk may benefit you why not drop us a query by completing the form below. We will aim to get back to you as quick as possible. Alternatively, if you want to book straight in you can do so by calling the clinic direct or by using our NEW online booking facility. You can see which therapist is available where and when so that you can control your diary more easily.